What's the Difference Between Semi-Tubular Rivets and Tubular Rivets? Are you wondering whether a semi-tubular rivet or a tubular rivet wold be the best choice for your manufacturing needs? Semi-tubular rivets and tubular rivets do feature distinct differences that should be understood in order to select the part that is most appropriate. The biggest difference between the two is that semi-tubular rivets have a shank hold depth of less than 112 percent of the shank's diameter, while a tubular rivet features a shank hole depth that is at least 112 percent of the shank diameter. 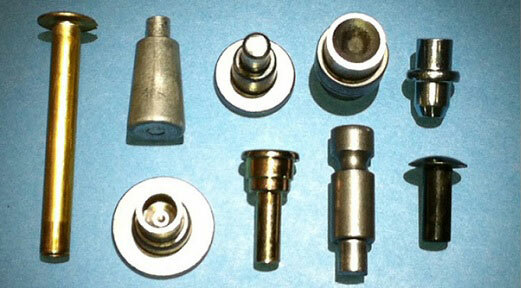 Both types of rivets perform quite well as fasteners to join work pieces together quickly and inexpensively. Semi-tubular rivets offer a number of distinct advantages over other parts, including solid rivets. For instance, the amount of force required to apply a semi-tubular rivet is approximately one-quarter that which is required to apply a solid rivet. A variety of platings and materials is available, with the most common types of metals used for this rivet being copper, steel, brass, aluminum, and stainless. Along with high assembly speed, semi tubular rivets also offer a number of other benefits, including easy inspection, high joint strength, and low install cost. The first step in choosing the proper type of rivet is evaluating the joint forces. This primarily involves shear forces and pull-apart forces. Shear failure can take place in a couple of different ways. For example, the work piece material or the rivet shank could give way, resulting in the rivet hole elongating. This can be prevented from occurring by choosing the correct diameter rivet. The placement of the rivet along the edge of the workpiece can also contribute to shear failure. When the rivet is positioned too near the edge, the workpiece material may cause the clearance hole to tear. When rivets are under shear forces, it is important to ensure that the rivet is placed twice its diameter from the edge of the workpiece. Pull-apart failure commonly occurs when the clinch is broken as a result of axial forces along the length of the rivet shank. Product testing can assist in determining the necessary rivet head diameter as well as clinch allowance to prevent this from occurring.